international scholars on topics addressing the global food system. With 60% of the world’s uncultivated arable land and seven of the top 10 fastest growing economies, Africa is a natural home for the next agricultural revolution. However, unlocking Africa’s full potential will require more than the experience gained in other regions: it will require developing and implementing regionally appropriate approaches to agribusiness. study brings its own story, while together we identify common elements of success across the case studies. Featured Businesses: Rooibos LTD., Greenway Farms-South Africa, Kati Farms-Uganda, WildFoods, Hillside Green Growers & Exporters-Kenya, Mountainside Farms Limited-Tanzania, Export Trading Group-Kenya, Dala Foods-Nigeria, TechnoServe, Zimbabwe, Hiruth Milk-Ethiopia, Bee Natural-Uganda, Woolworths and more. Agribusiness is projected to grow to a $1 trillion USD industry in sub-Saharan Africa within the next two decades. There is an increased understanding that focusing resources on increasing production in isolation from agribusiness does not position this region to achieve the potential of this dynamic development. Increasing the talent capacity in agribusiness is essential to realizing Africa’s economic transformation and development. This session will consider the dimensions and implications of the rise of an African consumer class over the next three decades. The presentation will highlight forward-looking, scenario-based analysis of changing consumer demand patterns and implications for the future size,composition, and structure of the new African food market. Panelists will focus on the implications of these changes for business strategy and for public-private partnerships to ensure needed public and private investments in Africa’s food systems to meet this new demand as efficiently and effectively as possible. M. D. Ramesh, President and Regional Head, South and East Africa, Olam International Ltd. This session focuses on the education and training adaptations required to meet demands of the rising African consumer class. The presentation will highlight the so-called “double pivot” that will have to be effected in African agricultural education and training, and how academia and industry can effectively partner to effect this change. This working group will examine the nutritional and public health implications of Africa’s changing diets and food system. The presentation will explore causes and consequences of the nutrition transition in Africa and elsewhere, including evidence on the rising rates of overweight, obesity, cardio-vascular and related diseases in Africa. The panel discussion will focus on possible preventative actions, exploring how Africa might learn from other regions about private and public sector actions that could help to moderate public health risks and effectively bend the curve in Africa’s nutrition transition. and public sectors needed to accelerate agricultural growth and food security in the region. Robin Callahan, Market Analyst, GLOBALG.A.P. Talent is the key to unlocking the potential of agribusiness globally. How do we address the complex challenges that agribusiness faces today— evolving value chains, food wastage, optimized production, ecological footprint, regulation and consumer perception? The answer is people! Through The Talent Factor we will focus on the tangible outcomes of raising the skills and knowledge of agribusiness professionals. From farm to table, DuPont plays a significant role along the entire food value chain. At DuPont, employees are putting science to work to address food security challenges, and creating solutions that are local, collaborative, and sustainable. Region by region, country by country and village by village – we are collaborating at new levels to help feed the world. In this opening keynote, learn how DuPont views Africa as a key region for achieving global food security. Roger Thurow —celebrated thought leader, award winning journalist and bestselling author—is following small groups of women and their children in four parts of the world— India, Uganda, Guatemala and the United States—through the 1,000 days period. He also will examine the innovations, the economics and the politics of malnutrition and hunger. Come and learn how these organizations are providing the technology for small and medium-sized enterprises to raise their level of professionalism, connect to market and build sustainable businesses. ICT, big data and financial inclusion tools are thriving at the field level and supporting millions to leap past traditional hurdles into the global economy. Take a hands-on tour of the Global Food Security Index, an interactive tool developed by The Economist Intelligence Unit (EIU) and sponsored by DuPont. This unique tool can support research and coursework, decision making and planning. The model can help assess the countries that are most and least vulnerable to food insecurity through categories of affordability, availability, nutritional quality and food safety. These factors help in studying the effect of poor or inadequate infrastructure, political corruption, and even soil quality on food security. Join experts from the EIU and put the Index to work. The Global Knowledge Initiative--recently dubbed one of the world’s top 100 innovations for the next century—has created a highly interactive Solutions Visioning workshop experience that gives participants an opportunity to shape bold, innovative strategies for addressing food wastage and spoilage in Africa. This initiative is supported by The Rockefeller Foundation’s Food Waste and Spoilage initiative <http://www.rockefellerfoundation.org/blog/new-innovations-reduce-harvest-loss>, which seeks to ensure that two million African smallholder farmers have greater income and economic opportunities, improved resilience and increased food and nutritional security through reduced post-harvest loss in food crop value chains by 2020. Join this session to learn about GKI’s model and to hear about the experiences of and outcomes reached by a select group of World Forum participants who will engage in a Solutions Visioning workshop prior to the session. This session will offer a highly interactive discussion for practitioners in larger companies focused on strategies for attracting, retaining and developing talent in emerging markets. We will explore insights from leading global companies regarding successful talent acquisition, leadership development and employee engagement initiatives in emerging markets. Along with our panel of corporate practitioners, the group will engage in lively discussion about what’s working in the region regarding people strategy. Joydeep Bose, President and the Global Head of Human Resources for Olam Internaional, Ltd. 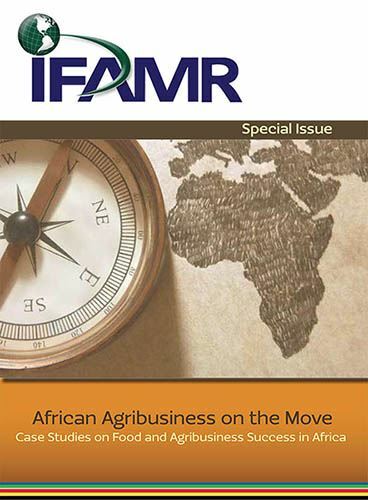 Earlier this year, FAO partnered with IFAMA and Stellenbosch University in a global call for papers on the topic of Enabling Efficient and Inclusive Agricultural and Food Systems in Africa. Fifteen papers were selected by a panel of FAO and external experts among dozens of contributions from young professionals from all over the world. The papers will form the basis for the symposium and include thought leadership on topics including: market access, value chain innovations and public-private partnership models. Each selected author will provide a brief overview of their work and will be available to interact with the audience for questions. The outcome of this event will be a book published by FAO with the goal of informing governments and development organizations on initiatives to improve inclusiveness and efficiency in agricultural and food systems. M. D. Ramesh, President and Regional Head, South and East Africa, Olam Internatonal Ltd.
Agribusiness is a global, entrepreneurial, dynamic and purpose-driven industry. However, around the world, talent attrition from agribusiness is growing rapidly. Younger generations are actively seeking careers in alternative fields including IT, healthcare and education. How can we more effectively communicate that all of these fields and passions have an intersection with agribusiness? As leaders, it is our responsibility to share the genuine nature of agribusiness. We must ensure our value system resonates with the next generation of leaders—there is no nobler purpose than Feeding the World. The concept of “40 Chances” was introduced in a best- selling book by Howard G. Buffet, where he describes that all farmers can expect to have about 40 growing seasons, giving them just 40 chances to improve on every harvest. We have to make every season count! This past Spring, IFAMA partnered with The World Food Prize Foundation to support the 40 Chances Fellows Program. Fellowship funds will be awarded to four social entrepreneurs under the age of 40 who are addressing issues of hunger, conflict, or poverty in Liberia, Malawi, Rwanda, and Sierra Leone. Ambassador Quinn will talk with us about the importance of the entrepreneurial spirit in agriculture and why we must nourish this, as we reflect upon the centennial anniversary of Norman Borlaug’s birth. As new knowledge on the role of gender in agricultural productivity emerges, the need to close the gender gap has become increasingly evident. Empowering women as economic, social, and political actors will result in more representative and balanced policy-level decision-making. In emerging regions, women need access to targeted resources such as: education and extension, financial services and technologies that optimize their time for value-adding, productive activities. Learn from these women about impactful programs that are successfully integrating women into agribusiness, creating models and leadership at the local and global level. This panel explores the business value of connecting company success with social progress and partnership. Partnering to achieve shared value outcomes is being highlighted everywhere from the lecterns of the most prestigious academic institutions to articles in popular press. Studies are correlating positive profitability outcomes to corporations who place social responsibility at the center of their mission. Join this discussion to learn how two of international agriculture’s leading organizations have experienced measurable business benefits through NGO partnerships. Thad Simons, Board President, IFAMA, President and CEO, Emeritus, Novus International, Inc. In today’s world, food’s journey from meadow to meal or hook to cook can include multiple steps, many vehicles, and several transformations. As demand for food increases, food is increasingly making longer and more complicated journeys with more companies participating in its production and delivery. As a result, the opportunities for the introduction and spread of contamination increase. The World Bank’s Global Food Safety Partnership is a unique public-private initiative dedicated to improving the safety of food in middle-income and developing countries. Learn how they raise the professionalism of people working in Food Safety by combining training and technical support so developing countries can improve their food safety systems and benefit from better compliance with food safety standards. Consumers and retailers worldwide are increasingly demanding safe, sustainably produced, and high-quality food, but ensuring that small-scale farmers are able to consistently meet these demands can prove difficult. Join GLOBALG.A.P. to learn about their first country-wide program integrating small-scale farmers into national retailer supply chains. Program initiators and industry representatives will explain how Good Agricultural Practices on food safety and sustainability practices have been adjusted to allow emerging farmers to enter a step-wise approach to meet the consumer requirements of modern retail, and how we can scale up this approach for all of Africa. Kristian Moeller, Moderator, Managing Director, GLOBALG.A.P. More than two-thirds of the African population relies on agriculture for their livelihood and the sector represents a third of the continent’s GDP. Efforts to improve agribusiness productivity will drive demand and growth in other economic sectors. A central challenge to scaling agriculture is a fundamental lack of skills and knowledge. A vibrant agricultural education training system, linked to relevant multi-sector stakeholders both on the continent and internationally, is essential. Join this session to participate in a discussion about the challenge and opportunities for broadly engaging Africa’s human capital for agriculture. Jon Vandenheuvel, CEO, Africa Atlantic Holdings Ltd. Since 1981, Land O’Lakes International Development has applied an integrated approach to economic development that capitalizes on the company’s 90 years as a leading farm- to-market cooperative-based agribusiness. Land O’Lakes applies practical experience and in-depth knowledge to facilitate market-driven business solutions that generate economic growth, improve health and nutrition and alleviate poverty. Come and learn how creating shared value fuels a profitable business and develops new, long-term markets. Land O’Lakes is pleased to be joined in this session by Pannar Seed, an experienced agricultural input supply company with research and development as its core activities. Pannar Seed is one of the largest field crop seed producers and suppliers in Africa and is a respected member of the international seed industry. Pannar was the first private company to introduce its own maize hybrids in South Africa in the 1960s and since then it has expanded its research and commercial activities into other crops and territories. Thomas J. Herlehy, Practice Manager for Agricultural Productivity and Competitiveness, Land O’Lakes, Inc.
A nation’s human capital endowment - the skills and capacities that reside in people and that are put to productive use - can be a more important determinant of long term economic success than virtually any other resource. The Human Capital Index details and measures countries on their ability to develop and deploy healthy, educated and able workers through four distinct pillars: Education, Health & Wellness, Workforce & Employment and Enabling Environment. Come to this session to learn about this valuable tool and how it can be leveraged as a resource for risk management and business planning. Like any start-up business, small and medium-sized agribusiness enterprises need access to affordable, basic business services and resources. Business leaders in these fledging organizations also benefit from mentoring and educational programs that support their decision-making and strategic planning processes. Join this session to learn about several innovative public-private partnership models that are helping to support and incubate SME agribusinesses and entrepreneurs across the continent of Africa. Bayella Thiam, Head of Africa, Novus International, Inc.